ABOUT THIS INTERVIEW: According to renown Beatles author Mark Lewisohn, this is the Beatles' first-ever radio interview. Lewisohn accurately describes it as rare and fascinating, not just for historical importance, but also because it's wonderfully intriguing. At the time of this 1962 interview, the Beatles are still making regular visits to Hamburg Germany, and Ringo Starr is so new to the group that he's still keeping track of how long he's been a Beatle by the number of weeks! 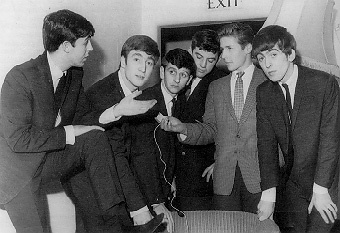 This interview takes place following the release of their first single 'Love Me Do,' and before the final version of 'Please Please Me' had been arrived at. At the time of this interview they have not yet had a #1 hit. It is a rare glimpse of the early Beatles, recorded on October 28th 1962 at Hulme Hall in Port Sunlight, on the Wirral in England. The interview was recorded for Radio Clatterbridge, a closed-circuit radio station serving Cleaver and Clatterbridge Hospitals, on the Wirral. Monty Lister was responsible for two of the shows on this station: Music With Monty, and Sunday Spin. The days of the Beatles' more widely broadcast radio interviews were still in the future at this time. This new group of youngsters is interviewed by Monty Lister, with additional questions from Malcolm Threadgill and Peter Smethurst.